Zack and I both love coconut. A couple weeks ago we made coconut rice and had left over coconut milk. Of course I knew I was going to make cupcakes with the leftover. First I will tell you a little story about the coconut rice. What a lot of people don't know about me is that I am a pretty good cook. I cook more than I bake and I really enjoy it, just not as much as I enjoy baking. I have contemplated starting another blog about non-dessert items, but am really not ready to commit the time to it. Plus when I cook, I want to eat and don't want to bother taking pictures of our dinner. Anyway, over the years it seems the one thing that gives me trouble when cooking is making rice. I know it should not be that hard but it is one of those things that I just seem to screw up. When we decided to make the Coconut Rice I accidentally added 1/2 cup of water...instead of 1 1/2! The rice had great coconut flavor, but let's just say it was a bit crunchy. Zack is the official rice maker in our house and I should have let him make it. 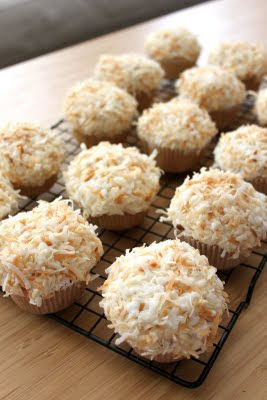 Anyhow, I came up with these cupcakes to use the rest of the coconut. If you are a coconut lover than you will love these cupcakes. 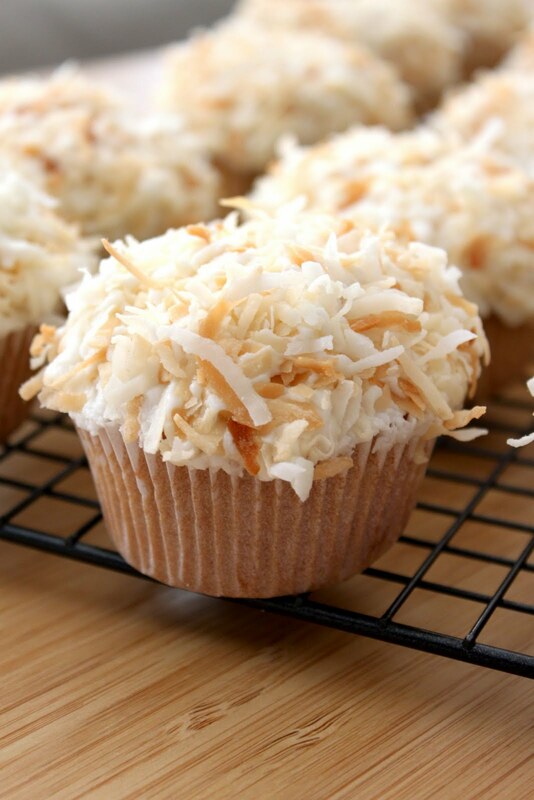 There is coconut milk and shredded coconut in the cake, coconut milk in the frosting, and topped with toasted coconut. In a medium bowl combine the flour, baking soda, baking powder, and salt. In a separate mixing bowl, cream the butter and sugar. Beat in the egg and egg white, one at a time. Add the vanilla and almond extract; mix well. Add the flour mixture to creamed mixture alternately with coconut milk (batter will be thick). Fill greased or paper-lined muffin cups with 1/4 cup of batter. Bake at 350 degrees F for 20-25 minutes or until a toothpick inserted near the center comes out clean. Beat butter, vanilla, and almond extract until creamy. Add salt. Add powdered sugar 1 cup at a time, alternating with coconut milk, beating until combined.